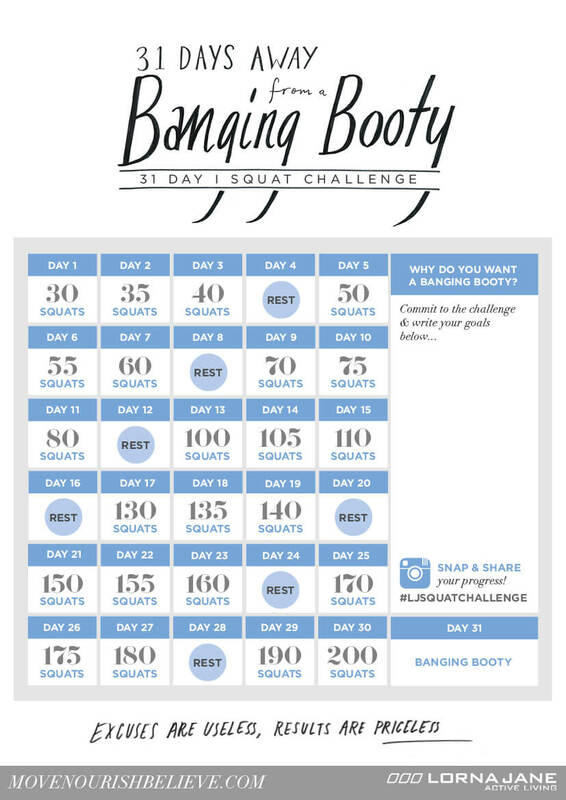 Yep, we’re bringing back the 31 Day Squat Challenge to get our booty’s in tip top shape just in time for Summer! First, make sure you download the Banging Booty Challenge here. Stand with your feet just wider than your hips and toes slightly turned out. Reach arms straight out in front, bend your knees to lower your body putting the weight in your heels and keeping your chest up. Squat until your hip joint is just lower than your knees keeping your feet in line with your knees. Push back up through your legs squeezing your glutes and standing tall. Rolling your knees in or outwards as you squat or stand up. Remember: When you’re carrying the weight of the world on your shoulders, squat. Because Booty. We’d LOVE for you to share your progress with us on social #ljsquatchallenge as well as anything you’re using for inspiration and motivation! Are your tights holding you back from starting the banging booty challenge? Bend and stretch with confidence in Lorna Jane's complete coverage fabric! Fully covered from downward dog to squats with absolutely no transparency in Lorna Jane’s Nothing 2 See Here TM leggings! Unique light blocking technology assures maximum coverage. Discover everything about the unique technology here. Interested in discovering Lorna Jane's full range of products? Shop online at www.lornajane.ca or visit their store at 295 Terminal Ave, Vancouver, BC V6A 2L7! Originating in Brisbane, Australia, Lorna Jane inspires women worldwide as the brand makes waves across the globe. Want more of the good stuff? Follow @lornajanecanada.